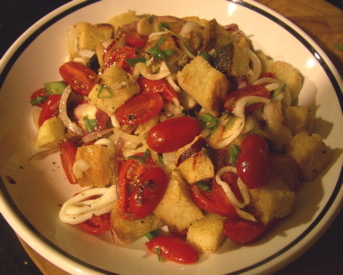 Grape Tomatoes, Fresh Red Onion, African Blue Basil, toasted Semolina Bread, lightly sauteed squid, olive oil and sherry vinegar. Yum. Best tomatoes yet. Straightforward and refreshing. Also, you can vote again AND double your own chances to win. And don't forget to vote for my friend-blogs as well, Not Eating Out in NY and Butter & Oil.